New Delhi : A 15-year-old Iraqi girl suffering from a rare bone marrow failure syndrome got a new lease of life after she received stem cells from an unrelated German donor. Doctors at a private hospital in Faridabad, where the girl underwent the procedure, claimed that this was the first case in Delhi NCR where a patient suffering from of severe aplastic Anemia was treated with a a matched unrelated donor (MUD) stem cell transplant with donor cells from international database. Aplastic anaemia is a condition when the patient’s body stops producing enough new blood cells which leave the patient fatigued, and at a higher risk of infection as well as uncontrolled bleeding. The patient, Banin Mohammad Humza, had started showing symptoms two-and-a-half-years ago and her condition was deteriorating with every passing day as she would require frequent platelet and blood transfusion. “She would develop infections and require hospitalisation every other day, as the white blood cells, which fight against infection, were low in her body,” Dr Prashant Mehta, a bone marrow transplant specialist at the Asian Institute of Medical Sciences, Faridabad said. 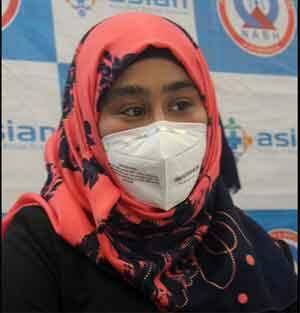 As doctors in her country gave up on her treatment, Banin’s family approached doctors here in India. “After evaluating her case, we reached the conclusion that the a bone marrow transplant was the only cure, he said. In Banin’s case, the doctors could not find any genetically matching (HLA) donors within her family. In around 75 per cent of these cases, a match in the family is not found raising the requirement for an alternative donor. The doctors then started searching for a suitable donor and checked the registries of donors of stem cells in India but in vain. So the doctors started looking at the registries of other countries and luckily they found a donor who matched her HLA type in Germany. “We put forth our request and the stem cells of the donor, a 25-year-old male, was harvested in Germany and shipped to India. It was then stored at minus 80 degrees Celsius for two weeks before being transplanted,” said Dr Mehta. Banin was then subjected to chemotherapy during which the damaged cells in her body were destroyed and new cells were administrated in her simultaneously. In the weeks that followed, the patient underwent intensive monitoring. “Her body accepted the donor cells and the procedure was successfully completed. At present, she is free of the disease and the blood count has normalised. She is on follow-up care on an outpatient basis,” Mehta said. MUD transplantation is uncommon in India due to risk of complications, besides logistic difficulties in procuring the cells from places outside India. Dr N K Pandey, Chairman and Managing Director of the hospital said, “While globally 45 million people are registered with ‘Bone Marrow Donor World Wide’ and other stem cell registries to meet the need of patients for a successful bone marrow transplant, in India the donor pool is very small. “It’s only around 3 lakh donor in Indian registries which is minuscule. It’s not only important to have more donors but also have the requisite technology to preserve the cells for a longer period,” he said.